More useless video game trivia. Re: More useless video game trivia. Squaresoft originally had plans for a North American release of Final Fantasy V. Reckoning that the game was too difficult for a SNES release, they intended to instead release it on the PC under the name Final Fantasy Extreme. This plan fell through, although Square would later use the English translation of the script they had made for Extreme in FFV's North American debut as part of Final Fantasy Anthology. The programmers working on The Oregon Trail originally wanted to have the player's food supply increase slightly any time someone died while the wagon train was starving. Management didn't like having implied cannibalism in an edutainment game and forced them to remove it. 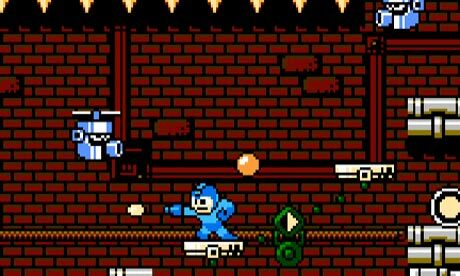 Megaman is called Rockman in Japan but they changed it to Megaman in America because a rock is a slang word for crack. Also, if Final Fantasy 7 would have been released on Nintendo 64 it would have taken up 13 cartridges. Haha, I'm skeptical as well. I've seen it a couple of times on the internet. Crackman would have been such a better name then Megaman. I mean can you even deny just a little bit that he doesn't look like a crackhead with those eyes in the 90s. so i guess by that logic, mm9/10 was when he relapsed? Oh most definitely. He crawled back to the pipe quicker than Mario and Luigi did. I played SMB1 the other day, as I do with relative frequency. However, this time I decided to play the Super Mario All-Stars version. I found it interesting that there were a few songs composed specifically for the SMAS version of SMB1: the Bonus Music, and two Bowser Battles. There's also new Title Screen music, which is a re-arrangement of the Underwater theme. As far as I know, none of these have ever been re-used in future games. Chinese names for Pokemon are a bit weird. Muk is "Ooze Freak" in Cantonese, and Jynx is "Bewildering Lip Lady" in Mandarin. The French term for the beat 'em up genre is "beat them all", or "beat'em all". Dark Link's exploitable behavior in Zelda II (where one can crouch in the corner and stab at him to easily win the fight) is the result of an RNG bug common in FDS-to-NES ports, and is not present in the original FDS version of the game. Spelunker (released in 1983) was a notoriously difficult, due to how easily the player character could be killed. The game has become a cult classic in Japan, and has inspired the idiom "spelunker's physique" (スペランカー体質), meaning someone who gets badly hurt by minor injuries. 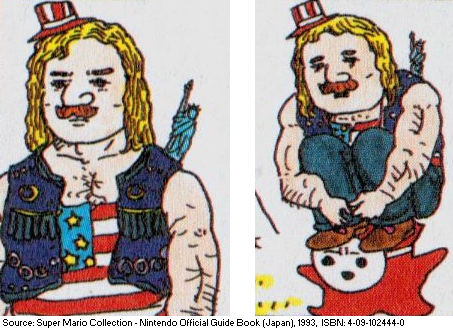 The official Japanese guide for Super Mario All-Stars includes these drawings of "American Mario", based on the game Super Mario USA (released internationally as Super Mario Bros. 2). ^I look forward to your additions to this thread now that you’ve got the Mariopedia. ^ That one actually wasn't in the Mario Encylcopedia. But here's one that was: Bowser's hitbox during the final battle in SMB3 only covers his upper body. This means that you can duck right under Bowser's feet (or even stand under him as little Mario) without taking any damage. This oversight is present in the NES version as well as the All-Stars remake. The name of the game Plok was inspired by the fact that the character you play as is named Plok. One of the main objectives in Super Mario Land 2: Six Golden Coins is to collect six golden coins. The Super NES platformer The Lion King is based on and named after a popular Disney movie of the same name. You cannot play basketball in NFL Quarterback Club '98. However, you can in NBA Give 'N Go. Despite both being sixth generation consoles, the Nintendo 64 cannot read Playstation discs, nor can the Playstation read Nintendo 64 cartridges. The Atari 2600 was not the 2600th console that Atari produced. Darknuts from the Legend of Zelda series are called "Tart Knuckles" in Japanese. I'd say that American Mario is racist if I were the easily offended type, but I actually want him to become canon. Mario is a stand up guy whom all Italian Americans should strive to emulate. Not only is he a superhero, but he's also a doctor, an Olympian, a tennis player, a plumber, a carpenter, a kart racer, construction & demolition worker, an artist, and he knows how to party on top of all that. He's like the John Quincy Adams of video game characters. The Shining Legends Incineroar from the Pokemon TCG has an attack called "Goddamn Punch". The English version of the card translates the attack to "Profane Punch".